On a Mac the Command key has an awkward position. There are workarounds but I think they come with their own problems. Remapping the keys in System Preferences remaps both Alt keys when you really only want to remap the left one, and Fn+F4 (Mac mode) is something you have to do every time you boot, and you can't use that in combination with Dvorak or Colemak mode. 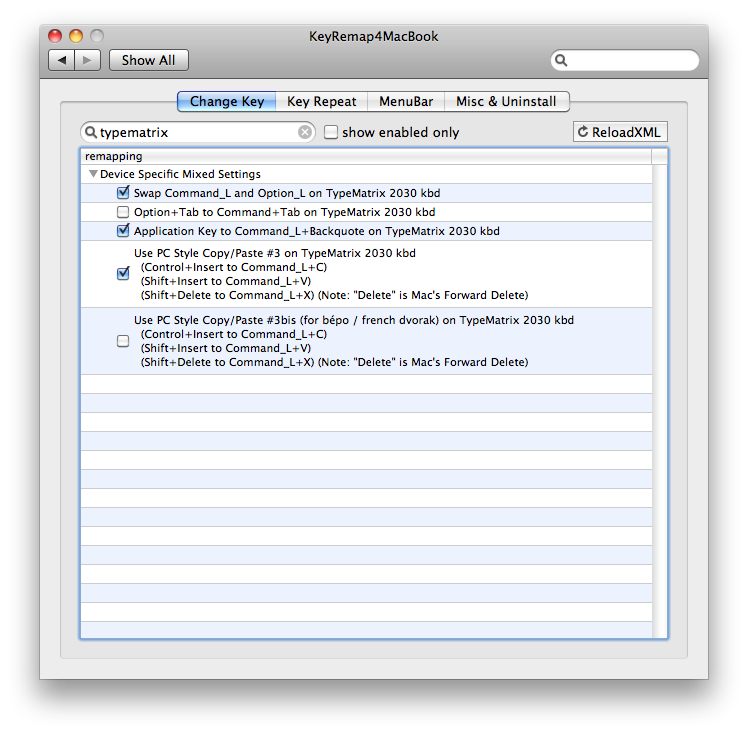 I finally found a proper solution which can fix that and other things like the App/Copy/Cut/Paste keys especially for TypeMatrix 2030 users: http://pqrs.org/macosx/keyremap4macbook/ Even though it's called "Key Remap 4 MacBook" it works with other Macs, not just MacBooks. In fact I'm using it on a Hackintosh with no issues at all. A sidenote: It can remap QWERTY -> Colemak similar to how the keyboard does it with Fn+F5. Using a custom layout in OS X doesn't work in all apps, such as StarCraft II but it does using this app. I made some tweaks so you can directly use cut-copy and paste by using DV in Mac OS X, so no need to use the hardware switch on Typematrix. For those who don't feel like typing or modifying the tags of the xml file, email me (the address is mentioned following the link) and I will email it to you. It's always great to see our customers contribute to the users community! @anders: Thanks for this tip. We'll pass this along to other Mac users having similar difficulties. @alancoman: Thanks for setting that up. This will likely help many of our Mac users. It seems to be ok but It doesn't work at all!